To trained eyes, the notifications and an accompanying, limited-distribution report show that “during the Obama administration, the Central Intelligence Agency obtained congressional communications about pending and developing whistleblower complaints,” said Grassley. His years-long pursuit of the documents dovetails with his more recent interest in obtaining disclosures of more documents pertaining to the termination of Dan Meyer, who for years was the ombudsman for the Intelligence Community. One of the documents, written by then-IC Inspector General Chuck McCullough, expressed concern that the CIA’s role creates “a chilling effect” on whistleblower disclosures. Atkinson, responding in an Oct. 29 letter to Grassley’s most recent Oct. 15 request, emphasized that he was prevented from acting promptly while new to his position. He said that procedures for responsiveness have since been improved, and that previous officials had felt that a briefing they gave to lawmakers had resolved the issue. “I share your concerns about the legal and policy implications raised by the information contained in the two notifications,” Atkinson added. 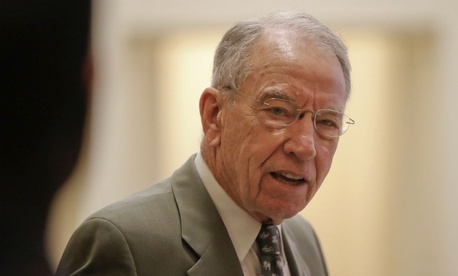 Government Executive confirmed the disclosures to Grassley with Atkinson’s office. What’s more, Meyer continued, “If a cadre within the Intelligence Community or any of the 72 or so federal offices with security clearances is slow rolling or obstructing compliance with a presidential directive, those officials need to answer for their insubordination. Such officials may be insider threats working against [Presidential Policy Directive]-19; they may also be unworthy to stay within the circle of trust by retaining a security clearance." Irvin McCullough is the son of former IC IG Chuck McCullough.